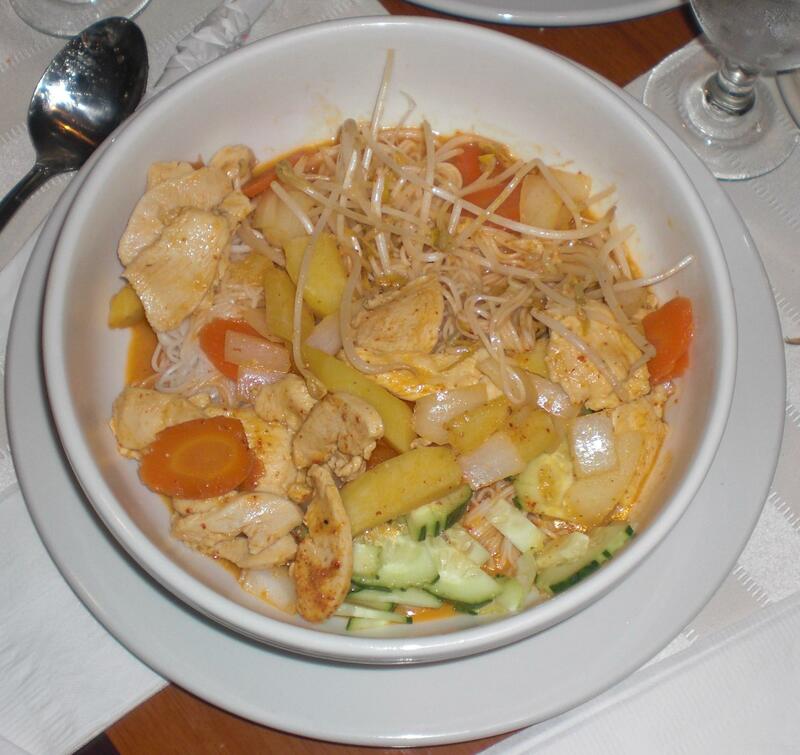 Phnom Penh Restaurant in Tucker, GA serves Cambodian cuisine. 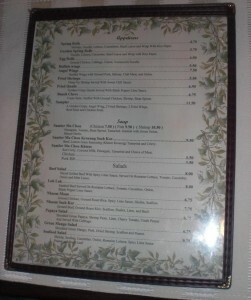 If you enjoy Thai and Vietnamese food you will find plenty on the Phnom Pehn menu to satisfy your palette. 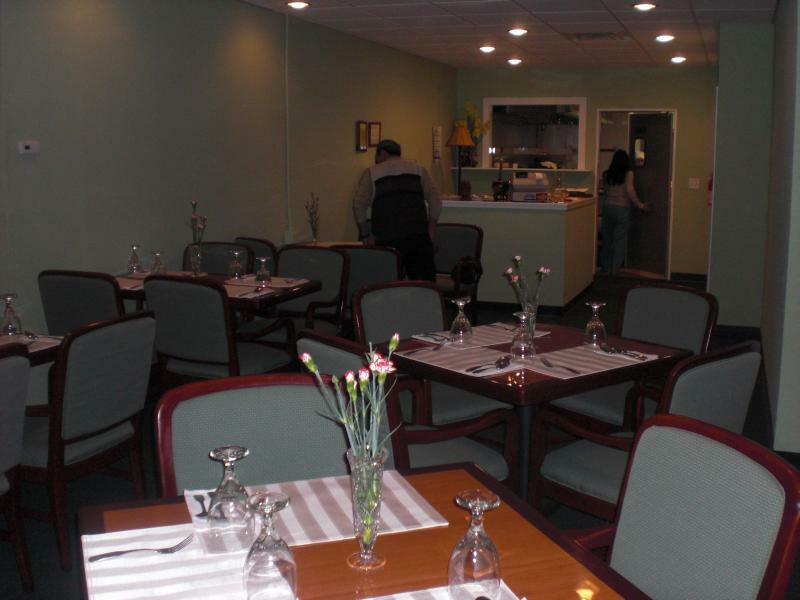 The restaurant re-opened on December 19th 2008 after being closed for two months for repairs after a small fire damaged the dining area. The tables, chairs and carpet are new and a nice upgrade from what I remember when eating there in July 2008. The following items were ordered for dinner on 3 Jaunuary 2009. 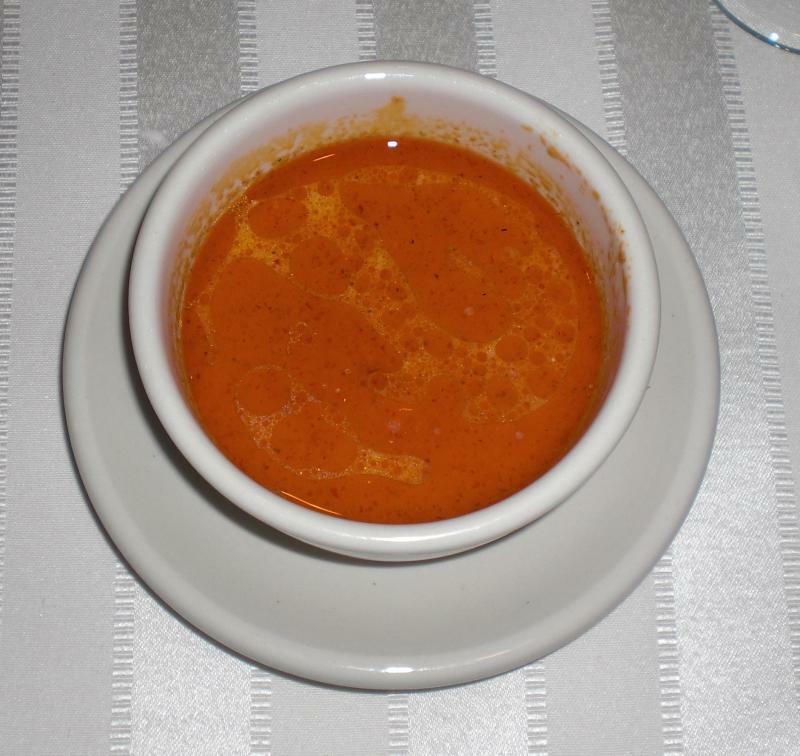 The first thing you’ll notice about the coconut soup is the color, it’s red. Not just the color but the flavor is different than what you find at most Thai places and frankly it’s also better.Â The soup was served hot and had some ground red pepper flakes floating on top, this soup ranks a 6 out of 10 on the spice scale. Lots of thin ginger slices, if you’re intimidated by ginger this is not the entree for you. The ginger is strong and well…wonderful. 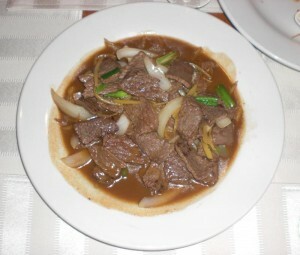 There was plenty of sauce under the meat that goes great with white rice. The beef was lean and a little too tough. I would suggest getting this with chicken. Here is one of those gems that you won’t find at your neighborhood drive-through. The quail is fried like good home-style fried chicken. The quail is a welcomed change from the same old chicken we’ve all had a thousand times before. 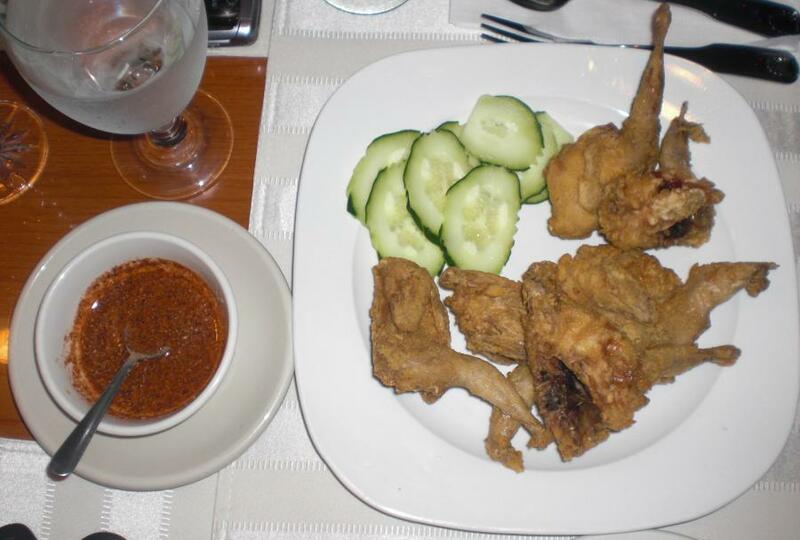 The black pepper sauce served with the quail is outstanding and if you like it, save some for the other things on your table. The sauce is a solid 7 out of 10 on the spice scale. 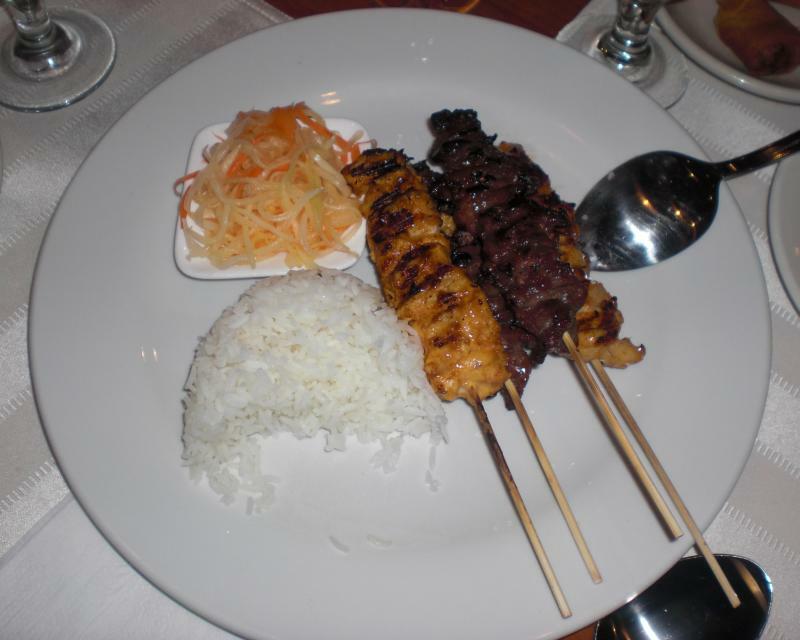 The beef and chicken sticks are a real treat and something that you must try if new to the Phnom Penh Restaurant.Â The marinated beef sticks have a sweet smokey taste. The chicken sticks are also delicious but not as flavorful as the beef.Â The “sticks” are a 4 on the spice scale. My wife described the Red Curry Noodles as comfort food. Thin noodles with chicken, potatoes, sprouts, carrots and cucumbers with a mild coconut sauce. The Red Curry Noodles rates only a 2 on the spice scale. For desert we had the fried banana which was actually plantain. The batter was thin and crispy, much like Japanese tempura.Â One thing that would promote these into a higher electron orbit would be a dusting of powdered sugar. 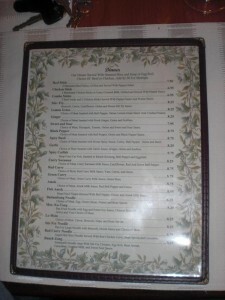 The service was very good, our waiter was attentive and friendly. 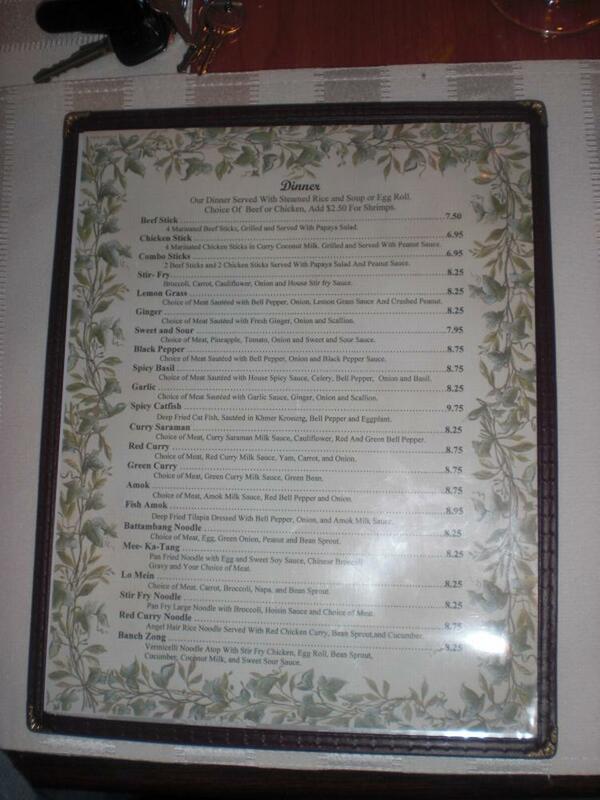 When asked, our waiter was quick to suggest choices from the menu and his recommendations were spot on. mmmmm. tasty. wish i’d been there! the coconut soup looks delish. This is one of my favorite spots to eat, and it’s a very welcome addition to Tucker!